On Saturday last a youth 15 or 16 years of age, son of Rev. 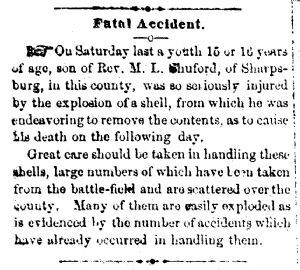 M. L. Shuford, of Sharpsburg, in this county, was so seriously injured by the explosion of a shell, from which he was endeavoring to remove the contents, as to cause his death on the following day. Great care should be taken in handling these shells, large numbers of which have been taken from the battle-field and are scattered over the county. Many of them are easily exploded as is evidenced by the number of accidents which have already occurred in handling them.